This small town on the NI down to Bloemfontein had some surprises for us. We had an hour or two to spare and thought on the way back from Winburg let's have a look into this place. We didn't expect to find much there, its just an other small town of the Freestate flaktes, so we thought. 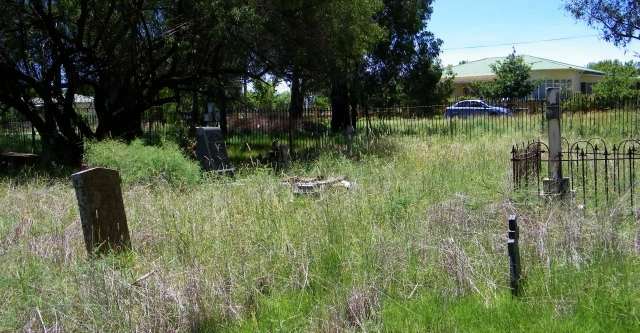 Soon after we turned off the N1 and driving down Eeufees Street we noticed a neglected cemetery, it turned out to be the old graveyard of the town going back to the 19th century. Certainly worth the stop and closer inspection. killed in action 25 Aug 1900. Here is what the Internet has to say about him: Although not a qualified Veterinarian he volunteered for military service while still a veterinary student. He came to South Africa during the Boer War as Farrier-Sergeant (No. 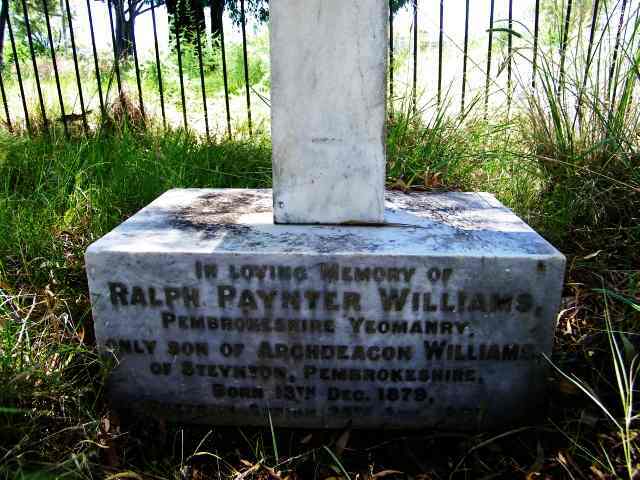 4123) with the Pembrockshire (9th Battalion, Imperial Yeomanry) Regiment and was one of the first of his regiment to be killed in action. 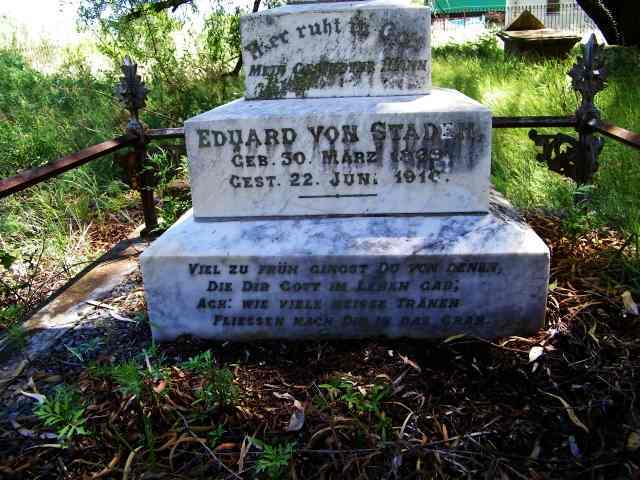 His death took place near Ventersburg, Orange Free State on 24 August 1900.
fliessen nach dir in das Grab. are running down into your grave. The reason I liked this one is because I often get quite cynical when reading some of the verses on grave stones, this one I thought was beautiful and very fitting to the situation as I imagine it. And then there is the fort, that is a place build under the leadership of P.A. Venter in 1858 for defence during the first Basuthu war. He is also buried there on the outside of the enclosure. The monument inside is to the builders of the ford. 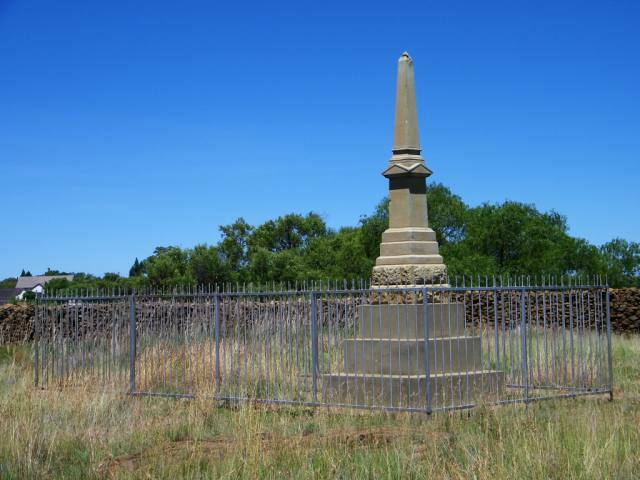 The town was established in 1872, but its beginnings can most likely be traced back to 1859 when the second congregation of the Gereformeerde Kerk in the Freestate was established on P.A.Venter's farm. And as usual a beautiful church in the centre of town.